Times of difficulty expose true strengths that may not be otherwise evident during times of rapid expansion. Cooperatives are becoming the success story of this recession. Co-ops tend to emerge when a group of people with similar economic needs band together to share resources and increase their market power. In his August 21, 2009 article for the Chicago Tribune, Greising highlights one fact about the potential of cooperatives to meet the needs of American consumers: many are already doing so. While initially said in the context of a discussion regarding health care co-ops, the statement can be appropriately applied to cooperatives in general. Credit unions have proved to be an outstanding example of cooperatives fulfilling the needs of their members when others are pulling out of the market. 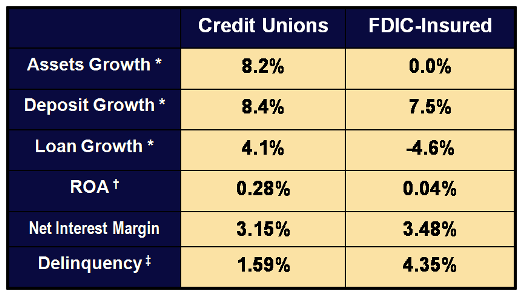 Credit unions out-paced their bank and thrift competitors in all major growth categories. Further, they have done so while posting a stronger return on assets (this figure is post-NCUA assessment) and lower delinquency. The credit union model has also led them to operate with a tighter interest margin, resulting in better value for members with both loan and deposit rates. Credit unions are focusing on products where their competitors are pulling back—mortgages, credit cards, small business lending, student loans—ramping up efforts to reach those in need of credit, and taking advantage of new opportunities in the market. As a result, credit unions have been increasing their market share. For example, credit union had a 20.9% auto lending market share in July, up from 15.8% a year ago. Mortgage market share is up to 5.3% from 3.9% a year ago. Further, credit unions have captured $58.1 billion in new deposits and originated $144.2 billion in new loans, both the highest on record. Nationwide, co-ops are coming into the spotlight, and the remarkable success of credit unions during this recession has helped fuel the discussion. Co-ops are seeing success in other industries as well, such as the natural foods industry. Cities like Detroit have been declared "food deserts" due to the flight of chain grocery stores from the area. One neighborhood reportedly contained one grocery store to 26 liquor stores, which is the grocers' equivalent to one financial institution branch to 26 payday lenders. Since the beginning of the recession, small food co-ops have begun to replace these chain grocers and meet the grocery needs of city residents with growing success. The National Cooperative Grocers Association, a collection of food co-ops across the country, has posted over $1 billion in annual sales, making it the third largest natural foods retailer in the country. Senator Kent Conrad (D- North Dakota) of the Senate Finance Committee predicts that health care co-ops will be equally successful, making this prediction in his editorial in USA Today: "[Health care] co-ops will capture 12 million customers, which would make them, collectively, the third-largest insurer nationally." While Congress considers approving approximately $6 billion in seed money for health care co-ops, looking to other industries in which cooperatives are making an impact may soothe the concerns of weary legislators. Time and time again during this recession we are seeing cooperatives of all shapes and sizes stepping in and filling the void left by market failures. Both quantitative and anecdotal evidence point to the validity of the cooperative model at resupplying the deserts that are appearing in this country, whether these deserts are food, financial services, or health care. As the nation watches the scandals and troubles of Wall Street corporations unfold daily, many have to be asking, 'isn’t there a better way to run a business that gives everyone—rather than a select few—a say in how the business is fun?' There is: cooperatively-run business.